TrendsAudio - High end but not high priced audio products ! 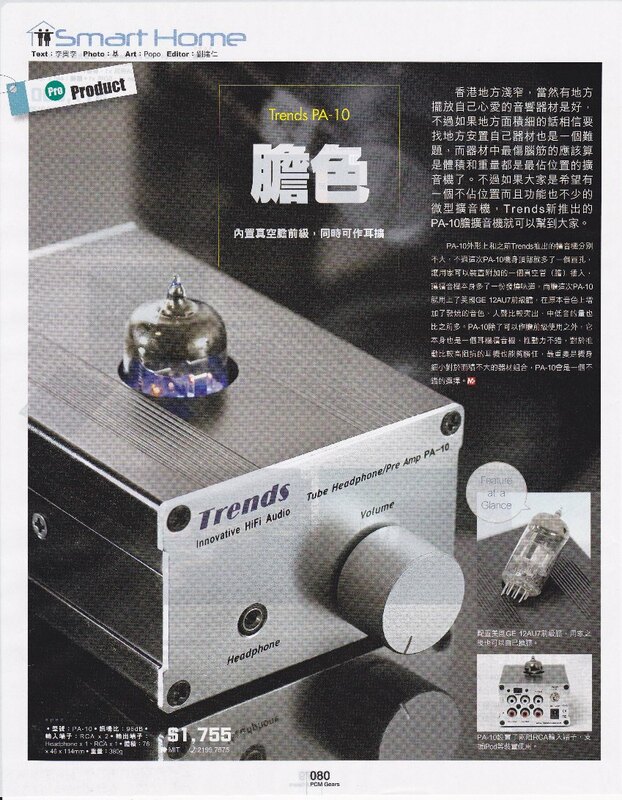 2018-06-08 remusic.it Read More... "...excellent detail on the whole range of frequencies for Trends TA-10.2P Class-T Power Amplifier." 2009-11-15 Roger Kanno, GoodSound.com, Read More... "new Trends components gave me hours of musical enjoyment and made reviewing them a pleasure." 2009-10-01 Nick Whetstone, TNT-audio.com in English Read More... "Moving the TA-10.2 to the main system in the larger listening room, I was pleasantly surprised at how much I liked it...."
2009-09-15 Ljubisa Miodragovic, Hi-Files Magazine Read More... "TA-10.2P je veoma interesantna sprava, otrov u maloj bočici, i zaslužuje svaku preporuku za početničke, pa i one bolje sisteme.."
2009-06-08 Florent GALLI, thresholdlovers.com in France Read More... "Et bien, il est hors norme !. " 2009-06-08 Florent GALLI , thresholdlovers.com in English Read More... "Well, awesome is probably the word to be used. " 2017-11-14 Dr. Richard Varey at witchdoctor.co.nz in New Zealand Read More ... "..The Teeny Tiny Amps That Can Power A Tower!" 2012-07-31 Editor at 《AV Magazine》 Read More ... Page 2 "Trends Audio掀起細機熱...."
2012-07-31 Editor at 《AV Magazine》 Read More ...Page 1 "Trends Audio掀起細機熱...."
2011-12-28 John Darko at digitalaudioreview.net.au in Austrailia Read More... "...this package system will still sound seriously forthright"
2009-11-15 Roger Kanno, GoodSound.com Read More... "comprise a good-sounding, compact tube-and-solid-state amplification system"
2009-10-15 Nick Whetstone, TNT-audio.com in English Read More... "Power to the Trends micro system.."
2009-09-15 Ljubisa Miodragovic, Hi-Files Magazine Read More... "- Kvalitetna mehanička izrada (važi i za TA-10.2P)." 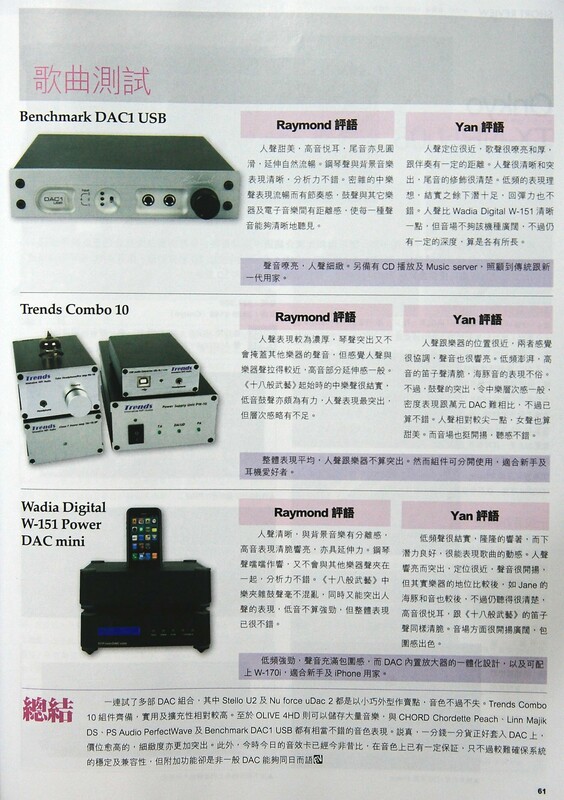 2013-05-23 Editor at 《AV Magazine》 Read More... “... 試問在這個價位的微型音響中，有哪一部可以bi-amp？"
2013-09-05 AV Magazine Read More... “... 性價比相當高，絕對是不容錯失的”. 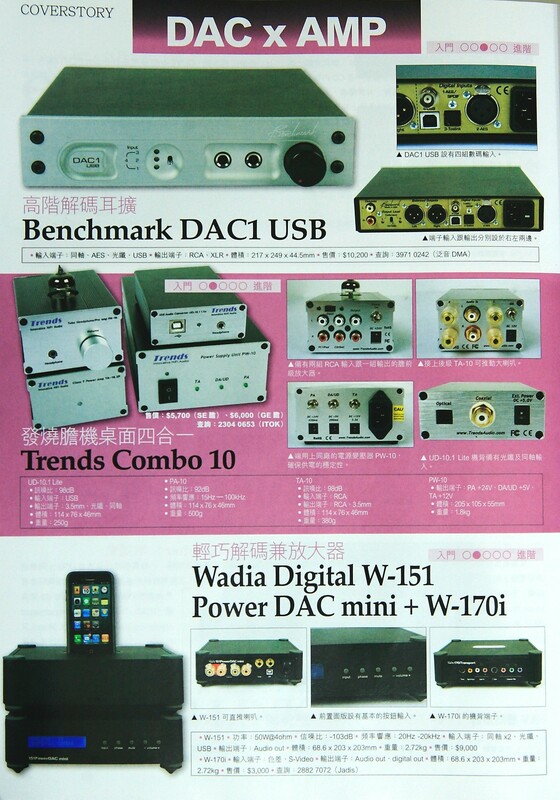 2012-12-18 野村at ITmedia.co.jp Read More... "... want to enjoy better sound”"
2011-10-15 Greg May at TrulyGadgets.com Read More.. “…. . "...it's hard to ar­gue with two in­puts in a tube amp for un­der $300"
2010-10-27 Martin H. Sabag at Hometheater.co.il in English Read More... " Warmer sound more pleasant to hear...."
2009-12-01 Steve Hui, Apple Daily Newspaper, Read More... "發燒音響, iPhone膽味濃…"
2009-11-15 Roger Kanno, GoodSound.com, Read More... "I heard the same bold, luxurious sound when... plugged into the PA-10 SE's headphone jack." 2009-11-08 Eitan Abar at hometheater.co.il Read More... " הסט נשמע טוב ואף יותר מכך. לא אכחיש שעבר אצלי ציוד יקר שאליו פחות התחברתי.כמו כן "
2009-10-18 Vincent Caponi at Stereomojo.com Read More... "Trends PA-10 Tube Preamp is an affordable and compact hybrid Swiss army knife type of preamp. " 2009-10-15 Nick Whetstone, TNT-audio.com in English Read More... "It surprised me a little just how much improvement the change of valve made." 2009-10-15 Astor Ng, AVMagazine Read More... "外形小巧得如手掌般大小…"
2009-10-06 Florent GALLI , thresholdlovers.com in English Read More... "PA-10 is a surprise. It is so brillant that you can challenge all the great preamplifiers." 2009-10-06 Florent GALLI, thresholdlovers.com in France Read More... "et bien c'est vraiment une surprise. Il est presque aussi doué que la plupart des grands préamplificateurs du marché actuel…"
2009-09-15 Richard Austen, Dagogo.com Read More... "I would say this is a good decision in a headphone system." 2009-09-15 Ljubisa Miodragovic, Hi-Files Magazine Read More... "Hrabra ideja.Dinamika. Prilično čista zvučna slika…"
2009-07-15 Astor Ng, AVMagazine Read More... "震音能完完全全清楚感受到,整體上三度空間感更大,而人聲同樣相當突出.."
2009-06-15 Todd Arthur, affordableaudio.org. 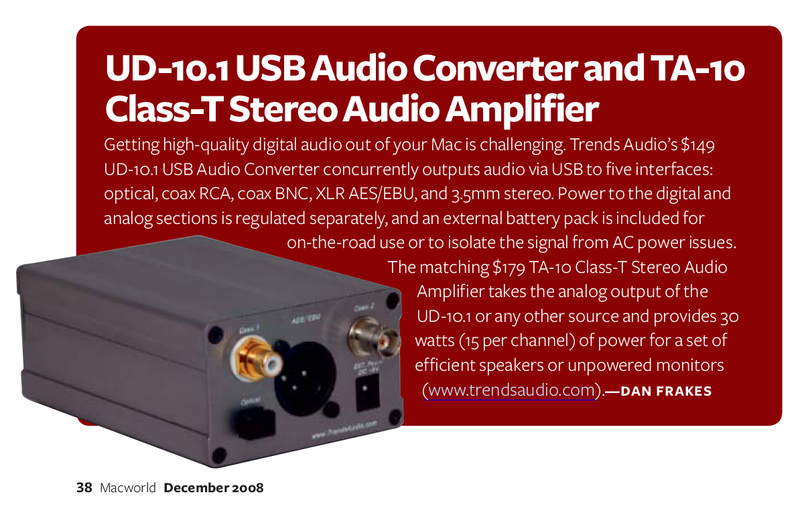 Read More... "…the most economical way to enter the world of true high fidelity headphone system"
2009-06-08 Stuart Andrews at Trustedreveviews.com Read More... "the price/performance ratio on the PA-10 is hard to beat. " 2009-03-15 Ghislain Prugnard at French What Hi Fi Magazine Read More... "C'est certainement un des meilleurs amplificateurs pour casque que nous ayons ecoutes ces demiers mois.."
2009-02-15 Nick Whetstone, TNT-audio.com in Italian Read More... "PA-10 è dunque promosso…"
2009-02-15 Nick Whetstone,TNT-audio.com in Englsh Read More... "it's a thumbs up for the PA-10"
2011-12-07 Pavel Víšek at Stereo & Video in Czech Republic Read More.. “…. the sound is dynamic and detailed, the amplifier is "a nice listen"
2011-11-02 Roel Van Nunen at Puresound.be Read More.. "... it’s a Price/Quality winner!" 2011-05-18 John Darko at digitalaudioreview.net.au Read More.. "... Every hifi lover should own one. " 2010-10-13 Rolf Winter at Image-hifi.com in Germany Read More... "...Dann allerdings kann der TA-10.2,, sehrsehr gut"(Jogi Low) klingen - nicht nur fur seine 230 Euro, sondern fur einen HiFi-Verstarker"
2010-05-14 Theo Tap Chí Nghe Nhìn at hifiVietnam.com Read More... "" Trends TA-10.2…. The magic box "
2010-05-04 Andre Marc at avrev.com Read More... "Trends TA-10.2 for iPod or iPhone...real sound staging, midrange clarity and jump factor"
2010-04-15 Joel Chevassus at, 6moons.com Read More... "TA-10.2 definitely make great sound...completely change the naure of a basic hifi." 2010-02-17 Marc Philip, magazine-audio.com in Canada Read More... “Le prix : 189$, c’est un « Best buy 2010 >> ! 2009-12-01 劉子聰, 《AV雙周 》 Read More... "慳位慳電小霸王……"
2009-10-19 Florent GALLI, thresholdlovers.com in France Read More... "vous aurez pour 80 fois moins, 80% du son de mon système de référence, ce qui est un exploit." 2009-10-19 Florent GALLI , thresholdlovers.com in English Read More... "you will have 80% of my reference system for 80 times minus in terms of cost !" 2009-10-15 Joel Kopping, Audio Video Magazine in South Africa Page 1 "well priced, delivers good sound and is powerful enough to deliver music"
2009-10-15 Joel Kopping, Audio Video Magazine in South Africa Page 2 "well priced, delivers good sound and is powerful enough to deliver music"
2009-09-15 Jeff Dorgay, TONE Audio Magazine Read More... "Why not hook up a $189 dollar amplifier to a six-figure system? 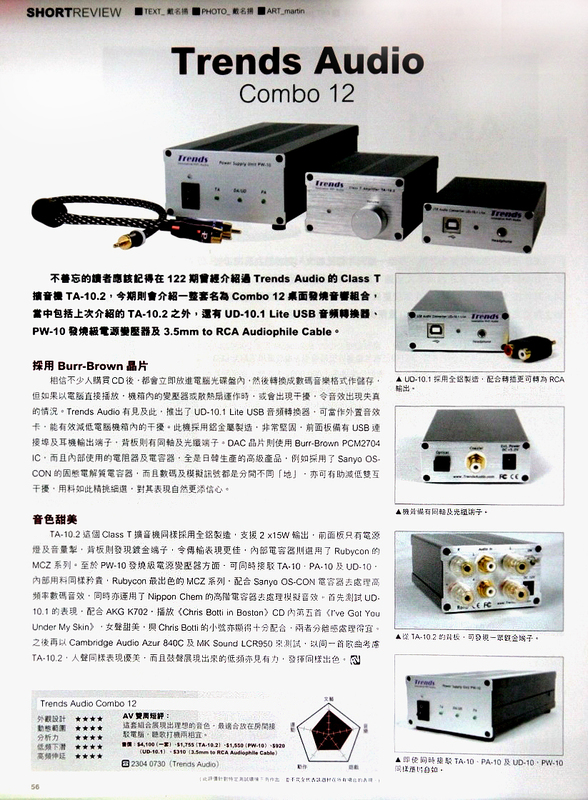 Very big sound in that small box"
2009-08-15 Astor Ng, AVMagazine Read More... "Trends TA-10.1 Class T合併擴音機, 掌上明珠…"
2009-08-06 Andrew Marshall, audio-ideas.com Read More... "...had more oomph and tightness in the bass in this configuration"
2009-05-18 Thomas Odeltorp, Hifi & Muski Magazine in Swedish Page 1 "Trends have a lovely attitude to the music, by its relaxed style of reproduction." 2009-05-18 Thomas Odeltorp, Hifi & Muski Magazine in Swedish Page 2 "Trends have a lovely attitude to the music, by its relaxed style of reproduction." 2009-05-18 Thomas Odeltorp, Hifi & Muski Magazine in Swedish Page 3 "Trends have a lovely attitude to the music, by its relaxed style of reproduction." 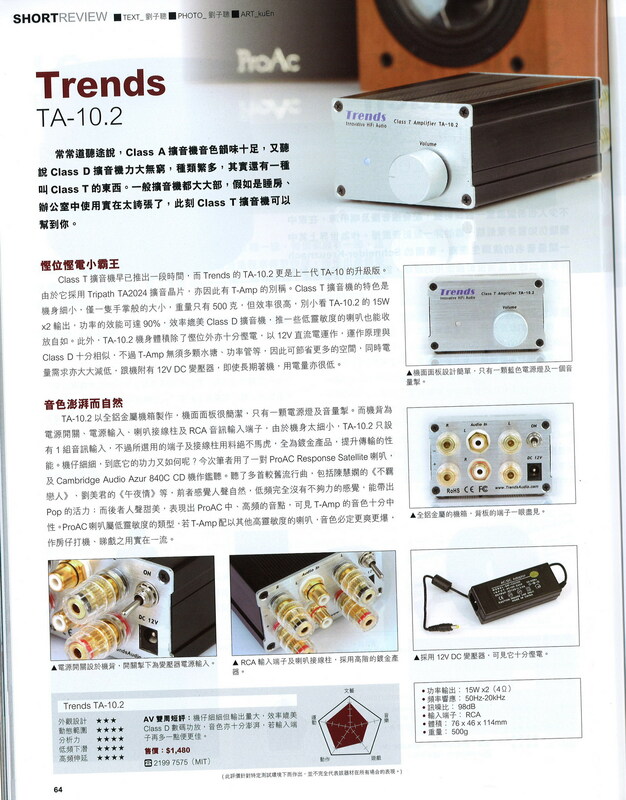 2009-05-15 Astor Ng, AVMagazine Read More... "Trends TA-10.1 Class T合併式擴音機, 外形的骰有型…"
2009-01-19 Florent GALLI , thresholdlovers.com in English Read More... "This amplifier gets our highest award and provided its ridiculous price, maybe even more"
2009-01-19 Florent GALLI, thresholdlovers.com in France Read More... "Cet amplificateur m?rite notre plus haute r?compense. Surtout compte tenu de son prix (aussi petit que sa taille), il m?riterait presque encore mieux!..." 2009-01-01 Von Cai Brockmann at image hifi in Germany Read More... ".....Audiophiler Bonsai-Alarm: So klein, und doch voll bei der Musik ! " 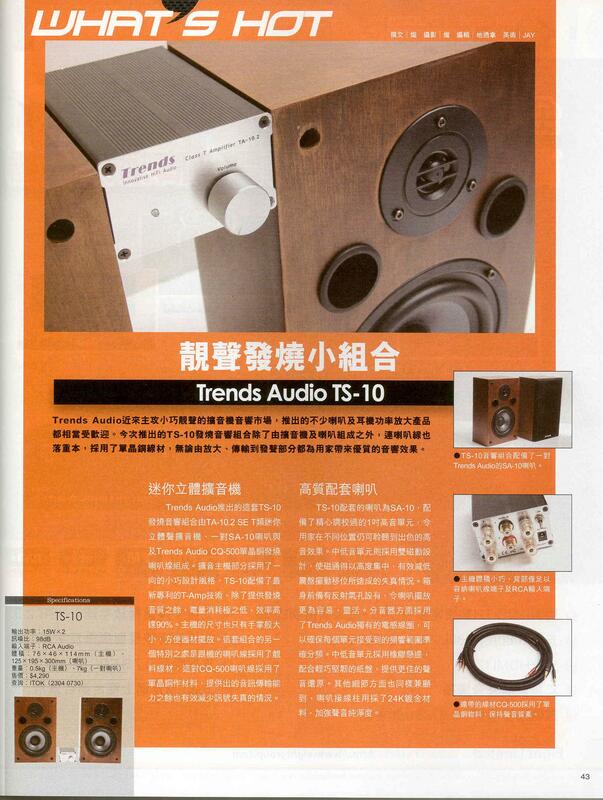 2008-11-15 Wilson, New Audiophile Magazine Read More... "Trends TA-10.1最讓人讚賞的表現應該是自然而充足的泛音,還是聆聽朗朗演奏的鋼琴,.."
2008-09-18 Audio Editor, Hxos magazine Read More... "Trends TA-10.1 is the best Class T-amp in the market." 2008-09-18 Michael S Jensen, hifi4all.dk Read More... "Trends TA-10.1 er testet meget positivt mange steder og er allerede ved at blive en legende i HIFI kredse verden over"
2008-09-09 Leo Yeh, my-hiend.com Read More... "【擴大機】不可思議！Trends Audio TA-10.1…"
2008-06-18 June 2008 AudioVideoFoto-Bild, . Read More... "Trends TA-10.1 ha dimensioni, potenza e funzioni limitate. Costa poco, ma promette un suono da fuoriclasse"
2008-06-15 Ralph Werner, fairaudio.de in German Read More... "bietet der TA-10.1 einen sehr hohen Gegenwert f?rs Geld.. ."
2008-06-15 Ralph Werner, fairaudio.de in English Read More... "Trends TA-10.1 offers screaming value for the money"
2008-05-15 Audio Editor, STEREO & VIDEO at www.stereo.ru Read More... "Усилитель составит отличный тандем любой высокочувствительной акустике, но даже с АС средней чувствительности результат может превзойти ваши ожидания.."
2008-05-11 Campbell Simpson, Goodgearguide.com Read More... "Trends TA-10.1 provides more than enough power for energetic music playback"
2008-03-14 Michael Bockhorst, energieinfo.de Read More... "Schon der TA-10.1 ist ein Produkt, welches nahezu perfekt ist"
2008-01-15 Thossaphol Wongvibulsin, hifimod.com Read More... "ตา หรือว่าขนาด ไม่มีใครคาดคิดว่าจะให้เสียงที่ดีได้ แต่จากการทดสอบแล้วฟังเทียบกับหลายๆชุด หากเอาผ้ามาคลุมแอมป์ แล้วเปิดให้คนในวงการฟัง อาจจะตีราคามันสูงกว่าค่าตัวมันไปเป็น 5-10 เท่าก็ได้…"
2007-12-28 Ron de Ridder, audiofreaks.nl Read More... "versterkers zijn die het beter doen dan de TA-10 maar in deze prijscategorie durf ik bijna te zeggen dat dit het beste is dat je kunt krijgen"
2007-10-05 Todd Arthur, affordableaudio.org. 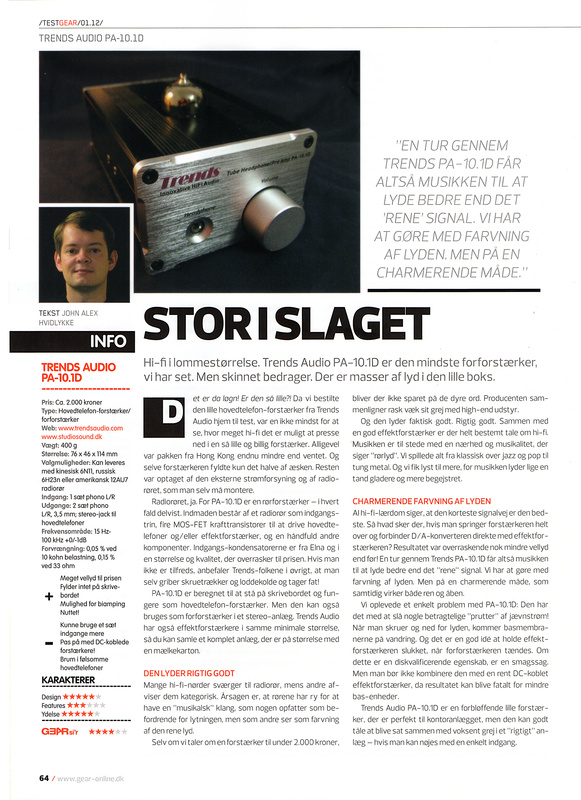 Read More... "I preferred the higher quality fit and finish and the more holographic imaging of Trends TA-10.1"
2007-08-15 Edgar Kramer, Sound & Image Magazine Read More... "Small but powerful, Trends TA-10 is the Napoleon Bonaparte of amplification"
2011-12-16 Tom Andry at audioholics.com Read More.. ".... affordable step into high-end audio!" 2011-12-28 John Darko at digitalaudioreview.net.au in Austrailia Read More.. "... this package system will still sound seriously forthright"
2010-11-02 Christian Rechenbach at Einsnull in Germany Read More... "...Sie suchen die kleine Einsteigerlösung, um vom PC Musik für die Anlage aufzubereiten? Oder zum Mitnehmen für Kopfhörer oder Miniverstärker? Bitte schön, hiermit haben Sie eine!" 2009-09-15 Richard Austen, Dagogo.com Read More... "The combination offers quick transients, nice dynamic range, and a crisp clear open presentation favouring the midrange"
2009-03-15 Editor, HIGH END 2009 in Germany Read More... "High end but not high priced audio products"
2008-12-15 Dan Frakes , Macworld Magazine Read More... "Getting high-quality digital audio out of your Mac is challenging"
2008-03-15 Mirko Roccia, Applicando, Read More... "qualita audio eccellente di tutti i componenti;ingombri minimi"
2007-11-15 Brett Gideon, Tone Magazine. Read More... "...One of the nicest computer-based hi-fi systems I've yet encountered." 2007-10-12 Groups.google.com Read More... "to use PC for better audio experience than going for individual Hi-fi music system"
2009-09-15 Richard Austen, Dagogo.com Read More... "the system sounds good, is relatively inexpensive, is highly portable, easily upgradeable "
2009-08-15 Matej Isak, monoandstereo.com Read More... "It is a big little man in world of quality audio reproduction!" 2009-07-15 Michele Surdi, 6moons.com Read More... "Trends Audio UD-10.1 Lite, David vs Goliath"
2009-05-15 Rolf Winter, image hifi Magazine Read More... "Ganz locker spielt etwa der kleine Lite mit Akkus besser, im Sinne von reichhaltiger, als der grobe Bruder ohne." 2008-11-18 Campbell Simpson, Goodgearguide.com Read More... "a fantastic and well-priced device for turning your PC into a high-end sound station." 2008-11-16 Kevin Hung, courant.com Read More... "Trends Audio's UD-10.1 Lite Makes Music Sound Better"
2008-10-15 Nick Whetstone, tnt-audio.com. Read More... " It's certainly one of the best, and most cost-effective ways to start experiencing PC audio! " 2009-06-15 John May, Music Lover Read More... "Trends is a genuine high-end performer and will provide years of listening pleasure "
2009-05-15 Rolf Winter, image hifi Magazine Read More... "Absolutes High End sind die beiden Knirpse zwar noch nicht, aber dafur unglaublich praktisch"
2009-05-02 Leo Yeh “小葉”, my-hiend.com Read More... "想在 High End 主系統上聽到存在電腦裡的音樂，那麼 UD-10.1 的確是個便宜又大碗的選擇！"
2008-12-08 Martin H. Sabag , hometheater.co.il. Read More... " נותן תמורה מצוינת לכסף לאילו מכם אשר מחפשים כרטיס קול איכותי ולא יקר למטרת שמיעת מוזיקה בסטראו Trends UD-10.1"
2008-11-19 Campbell Simpson, Goodgearguide.com Read More... "With its extra, professional-level outputs the UD10.1 might be the AV accessory you've been searching for." 2008-11-09 Chris Connaker, computeraudiophile.com Read More... "Computer Audiophile conclusion = Add To Cart." 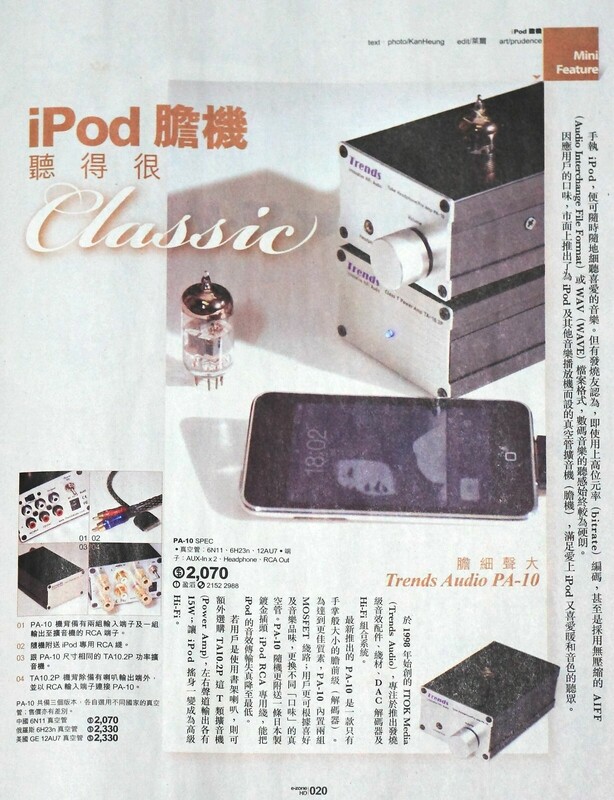 2008-06-28 David Price, June 2008 Hi-Fi World Read More... "Trends Audio UD-10.1 a surprisingly mature hi-fi product,"
2008-01-15 Ghislain Prugnard, What Hi-Fi French Magazine. Read More... "meilleure qu'une carte audio integree. excellente passerelle entre un ordinateur et une chaine hi-fi, "
2007-12-15 Roger Kanno, GoodSound.com, Read More... "...not just for the convenience, but for the better sound. 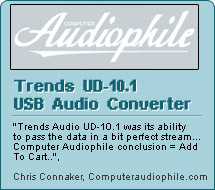 The UD-10.1 is that good." 2007-11-28 Miodrag Vasic, HiFi Cafe, Read More... "i dvoboj PC V CD ostaje za neku drugu priliku." 2009-11-15 Roger Kanno, GoodSound.com, Read More... "comprise a good-sounding, compact tube-and-solid-state amplification system"